Atmospheric dynamics compound very diverse multi-scale complex phenomena, from synoptic-scale motions to small-scale turbulence interlinked through chemistry, radiation and clouds. 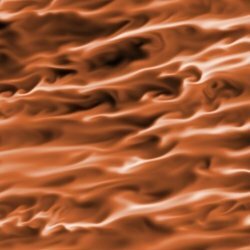 Turbulence is the focus of this Max Planck Research Group. Our goal is to improve our current understanding of geophysical turbulence and its role in the susceptibility of the earth system. The tools that we use are theory and simulations. A key feature of turbulence is that it drastically enhances mixing rates. In some regions of the atmosphere, a simple parametrization of that enhancement of mixing rates is sufficient to represent the effect of turbulence. For the regions in which we are interested, however, turbulence might act as a controlling process and its details become relevant. In order to faithfully resolve the small-scale turbulence that is relevant in those regions, we use direct numerical simulation, which has become feasible only in recent years thanks to the progress in supercomputing. Our research currently focuses on clouds and planetary boundary layers. Clouds constitute disperse and dilute multi-phase turbulent flows in which the suspended particles are liquid droplets and ice crystals, and the carrier gas is a mixture of dry air and water vapor, water undergoing phase transition. Turbulent multiphase flows constitute an area of active research by themselves. In the earth system, the problem is even more complex because of the link to radiative transfer, hydrological cycles, and aerosol transport. It is well established that clouds is one of the most important topics to be addressed in the coming years, since they are a major source of uncertainty in climate and weather prediction. In our group we aim at the first part of the problem, namely, at the description and analysis of small-scale processes associated with turbulent multi-phase flows and the simulation of them. The focus is on how to extend current continuum formulations of the system to incorporate part of the complex phenomena associated with phase transition and intertial effects, on the limitations of it as well as possible alternatives. How do turbulence, stratification, latent heat, radiative transfer and microphysics interact at cloud boundaries? How does the relative importance of those interactions depend on the environmental conditions? What is the relative importance of large scales and small scales in those interactions? How can we represent those interactions in mixed-layer models? How can we use direct numerical simulations as reference for large-eddy simulations? The region of the atmosphere directly affected by the surface extends vertically from a few hundred meters to a couple of kilometers, and it is called the planetary boundary layer or the atmospheric boundary layer. It is typically in a turbulent state. Turbulence can be sustained by the heat transfer from the surface, when cellular patterns like the ones shown to the left of this text are often observed. The relatively warmer regions organize into ascending layers and transport away the heat that has been transferred from the ground to the air mass that descends in between. In the upper region of the boundary layer, the interaction of turbulent motions and the stable inversion dictates the rate at which free-atmosphere air is entrained into the boundary layer, controlling the boundary layer growth. Although major aspects of this system are well understood, key processes associated with small-scale turbulence at the lower and upper regions of the boundary layer remain a challenge. Turbulence in the planetary boundary layer can also be sustained by a mean horizontal wind and the resulting strong shear that forms next to the surface. In this situation, the flow structure next to the ground changes notoriously, from the cellular pattern mentioned before to the elongated structures observed in the picture to the right. How do shear driven turbulence and buoyancy interact? Both convectively unstable and stable conditions pose interesting questions and are relevant for society, whether it is wind energy or air quality in the cities. The interaction of this turbulent flow with a stable background stratification, however, is particularly challenging. As the surface cools down, the turbulent kinetic energy diminishes because of the increasingly heavier parcels of fluid that are transported upwards. A point might be reached in which turbulent mixing is inhibited in an intermittent way, modifying the cooling rates of the surface. This is another problem that attracts considerable attention of the scientific community and we are currently exploring new ways to study it and represent it in models. How do entrainment-zone properties depend on the interaction between shear and convection? How does this interaction depend on the environmental conditions? How can we represent entrainment-zone properties in simple atmospheric models? What are the corresponding moisture properties? How do large-scale motions influence near-surface properties?